The San Diego Association of Governments (SANDAG) is leading the project and works alongside the Department of Transportation (USDOT), Caltrans, the Metropolitan Transit System, the North County Transit District and the Cities of Escondido, Poway and San Diego with Parsons Corporation as project integrator. To provide a real-time modeling tool for the decision support system (DSS) as part of the pioneering integrated corridor management system (ICMS) on Interstate 15 (I-15) in San Diego. SANDAG expects the ICMS project to help with the implementation of multimodal and smart growth principles, to improve safety throughout the corridor, increase traveler information mechanisms, institutional partnerships and networked transportation systems, both during recurrent and non-recurrent conditions. The USDOT’s final objective is to roll out the ICMS nationwide, so that every large city can derive some benefit from what is being achieved in San Diego. 2010: Interstate 15 in San Diego chosen as one of the US pilot sites for developing, implementing and operating an ICMS. February 2014: Successful Coordinated Test Plan of a fully automated multi-modal corridor handling of a freeway incident. 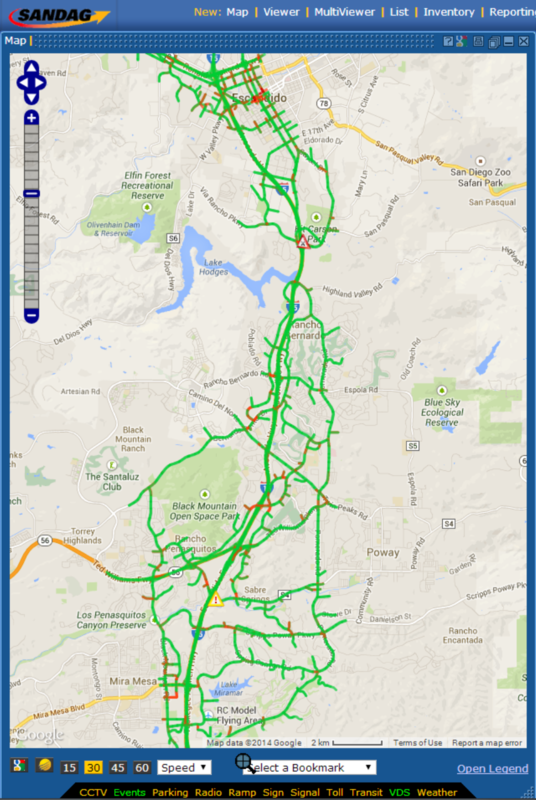 2015: The ICM San Diego I-15 Aimsun network is added to the Dynamic Mobility Applications (DMA) – Active Transportation and Demand Management (ATDM) Analysis, Modeling and Simulation (AMS) Testbed Project. 2016: Maintenance contract signed for the following 5 years. Aimsun and Parsons are in charge of maintaining the system with regular monthly meetings and constant monitoring. Dec 2016: Post-Deployment Assessment Report delivered, which evaluates the benefits of Aimsun Live after implementation. 2017-2018: The Federal Highway Administration (FHWA) selects the ICM San Diego ICM network to evaluate Alternative Designs to Alleviate Freeway Bottlenecks at Merge/Diverge Weaving Areas. Dec 2018: new contract for the Implementation of the new traffic control system “Transparity” and new Ramp Metering algorithm “URMS”. What is the I-15 ICMS? The I-15 ICMS is one of the first working examples of management integrated with prediction. Predicting rather than reacting allows the anticipatory administration of an area that is very complex in terms of transport and mobility. This project aims to operate and manage individual transport systems as a unified corridor, including the highway network, toll lanes, the surrounding arterials and the public transport network in the area. The I-15 ICMS is designed to optimize capacity and efficiency, reducing delays and obtaining more reliable journey times without the need for investment in additional infrastructure (namely, more lanes for private traffic). 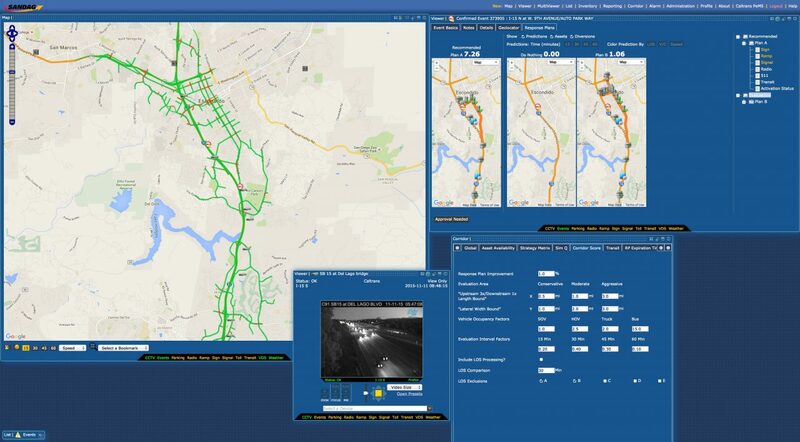 The general vision of I-15 ICMS is the use of real-time tools to obtain predictions for the whole project network in order to obtain strategies for managing congestion pre-emptively. For example, combining the controls of ramp access to the highway with changes in the control plans in the arterial network to manage recurring rush hour congestion, together with route diversions, properly monitored to avoid greater disturbance in non-recurring incident situations. Focusing on a 20-mile stretch of Interstate 15 between San Diego and Escondido, the project introduces ‘smart’ traffic management technologies and concepts never used before in the US: the project’s pioneering Decision Support System (DSS) uses strategies such as network traffic prediction, online microsimulation analysis and real-time response strategy assessment to give system managers comprehensive awareness of the current and predicted future performance of the entire corridor. Rather than reacting to traffic conditions, managers can now anticipate problems before they arise and take preventative action using ICM strategies such as responsive traffic light synchronization, coordinated ramp metering or bus priority on arterials. One of the reasons the I-15 was selected as a test bed was that the I-15 environment includes some of the most advanced ITS infrastructure available: dynamic ratio ramp metering, adaptive control on roads parallel to the interstate, reversible high occupancy vehicle (HOV) lanes and high occupancy tolls (HOT) with dynamic pricing along with systems for disseminating advance information about traffic incidents. Core to the ICM solution is the ability to forecast and simulate congestion and capacity imbalances in real time or near real time. The DSS allows continuous predictions every 5 minutes, to monitor and anticipate congestion hot spots and launch evaluations of the available strategies to select the best response, therefore minimizing congestion and guaranteeing more accurate journey times for both drivers and users of public transport. The multimodal Decision Support System (DSS) integrates two tools: the Parsons Intelligent NETworks ATMS, for field device monitoring and control, center-to-center data fusion, event management and response plan generation, and Aimsun Live. Aimsun Live uses live data feeds and simulations to dynamically forecast traffic conditions based on the current state of the network, which helps system managers to evaluate incident response or congestion management strategies. Launched in May 2014, the free 511 San Diego mobile application (available for iOs and Android) is funded by the U.S. Department of Transportation. 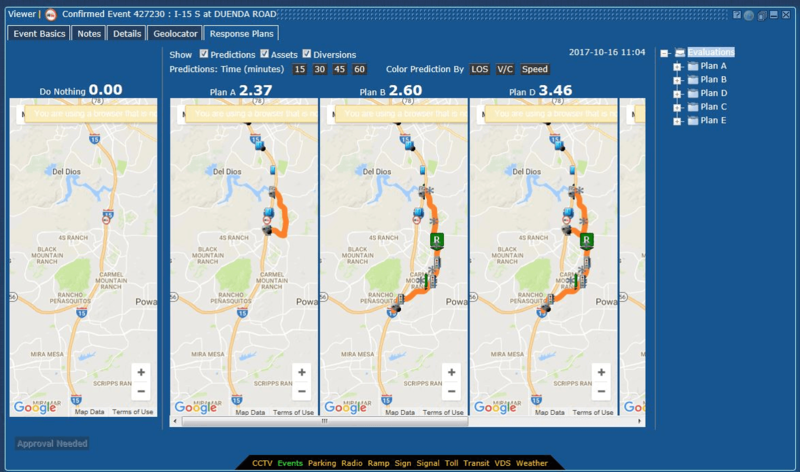 The app, designed by Iteris, provides real-time predictions from Aimsun Live and system based advisories, letting users view predictive travel times on I-15; current traffic conditions; MTS bus routes, fares, arrival times; real-time dynamic toll rates for the I-15 Express Lanes; and it also uses text-to-speak to give users alerts for the latest incident and construction information in the region. Since 2014, the system has been able to run in an automated stage where the system takes automatic control of signals and ramps when recommended by the simulated evaluations. This may be the first time in the US that traffic management decisions are being successfully made entirely based on automatically triggered real-time simulations of the entire multi-modal transportation network. Thanks in large part to the success of the ICM system, in 2015 USDOT added the SANDAG ICM network to the Dynamic Mobility Applications (DMA)-Active Transportation and Demand Management (ATDM Analysis, Modeling and Simulation (AMS) Testbed Project. The vision is to develop high-fidelity analytical tools and a platform to test the new and evolving concepts with high resolution and to mimic real-world operations in a simulation environment. 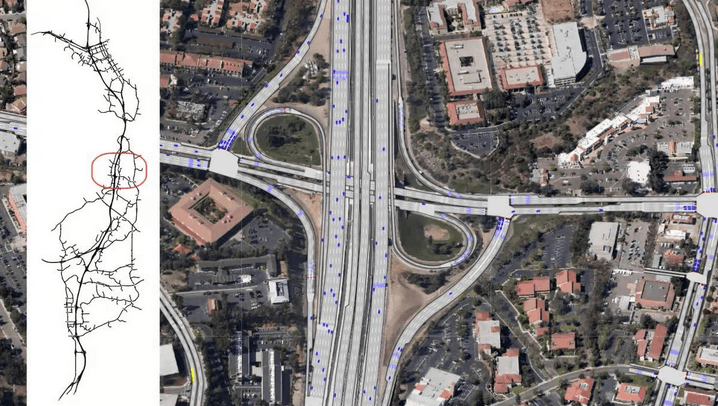 The proliferation of ITS applications coupled with SANDAG´s deep and pioneering use of modeling for planning and operations, has made the San Diego I-15 model the perfect testbed for both ATDM and DMA. The ICM network is being used to assess the role that predictions play within ATDM, incorporation of new functionality to the corridor (Speed Harmonization, and Dynamic Merge Control) and the sensitivity of the duration of a prediction on the effectiveness of a decision support system. Intelligent Network Flow Optimization (INFLO) and the Cooperative Adaptive Cruise Control (CACC) have been incorporated into Aimsun Live, with Multi-Modal Intelligent Traffic Signal Systems (MMITSS) and Trajectory Conversion Algorithm (TCA) coming in the near term. At the heart of the DSS is Aimsun Live, which uses live traffic data feeds and simulations to dynamically forecast future corridor traffic conditions based on the current state of the network. The 511 mobile app: The app is fed information from the integrated corridor management system, which uses existing sensors and cameras to gather traffic information along the I-15.